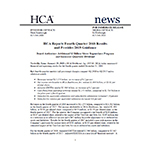 NASHVILLE, Tenn.--(BUSINESS WIRE)--HCA Healthcare, Inc. (NYSE: HCA) today announced financial and operating results for the fourth quarter ended December 31, 2018. Revenues in the fourth quarter of 2018 increased to $12.274 billion, compared to $11.562 billion in the fourth quarter of 2017. Net income attributable to HCA Healthcare, Inc. totaled $1.064 billion, or $3.01 per diluted share, compared to $474 million, or $1.30 per diluted share, in the fourth quarter of 2017. For the quarter, the Company recognized a tax benefit of $236 million, or $0.67 per diluted share, related to the impact of the Tax Cuts and Jobs Act, $169 million due to a reduction in its effective tax rate and a $67 million favorable adjustment to its deferred tax assets and liabilities. Results for the fourth quarter of 2017 included a non-cash increase in the Company’s provision for income taxes of $301 million, or $0.83 per diluted share, related to the estimated impact of the Tax Cuts and Jobs Act on its deferred tax assets and liabilities. During the fourth quarter of 2018, the Company incurred additional expenses and experienced losses of revenues estimated at $31 million, or $0.07 per diluted share, associated with Hurricane Michael’s impact on our Florida panhandle facilities. This amount is prior to any potential insurance recoveries. Also, during the fourth quarter of 2018, the Company recorded a benefit of $49 million, or $0.11 per diluted share, from an insurance recovery related to Hurricane Harvey business interruption losses incurred during 2017. The Company recognized a tax benefit of $551 million, or $1.55 per diluted share, on net income attributable to HCA Healthcare, Inc., excluding gains on sales of facilities and losses on retirement of debt, for the year ended December 31, 2018, related to the impact of the Tax Cuts and Jobs Act, $484 million due to a reduction in its effective tax rate and a $67 million favorable adjustment to its deferred tax assets and liabilities. Results for the year ended December 31, 2018 also include a $124 million tax benefit, or $0.35 per diluted share, compared to $82 million, or $0.22 per diluted share, for the same period of 2017, related to employee equity award settlements. Results for 2017 also included a non-cash increase in the Company’s provision for income taxes of $301 million, or $0.81 per diluted share, related to the estimated impact of the Tax Cuts and Jobs Act on our deferred tax assets and liabilities. Results for the year ended December 31, 2018 include a reduction in the Company’s reserves for professional liability risks of $70 million, or $0.15 per diluted share. The Company’s provisions for professional liability risks are based upon actuarially determined estimates and are included in “other operating expenses” in our consolidated income statements. During the year ended December 31, 2018, the Company incurred additional expenses and experienced losses of revenues estimated at $31 million, or $0.07 per diluted share, associated with Hurricane Michael’s impact on our Florida panhandle facilities. This amount is prior to any potential insurance recoveries. Also, during the year ended December 31, 2018, the Company recorded a benefit of $49 million, or $0.11 per diluted share, from an insurance recovery related to Hurricane Harvey business interruption losses incurred during 2017. As of December 31, 2018, HCA Healthcare, Inc.’s balance sheet reflected cash and cash equivalents of $502 million, total debt of $32.821 billion, and total assets of $39.207 billion. During the fourth quarter of 2018, capital expenditures totaled $1.153 billion, excluding acquisitions. Cash flows provided by operating activities in the fourth quarter totaled $2.175 billion, compared to $1.734 billion in the fourth quarter of 2017. The HCA Healthcare, Inc. Board of Directors has authorized an additional share repurchase program for up to $2 billion of the Company’s outstanding common stock. Repurchases will be made in accordance with applicable securities laws and may be made at management’s discretion from time to time in the open market, through privately negotiated transactions, or otherwise. The repurchase program has no time limit and may be suspended for periods or discontinued at any time. HCA today announced that its Board of Directors declared a quarterly cash dividend of $0.40 per share on the Company’s common stock. The dividend will be paid on March 29, 2019 to stockholders of record at the close of business on March 1, 2019. 2019 guidance includes estimated financial impact of the Company’s Mission Health acquisition, which is expected to close on January 31, 2019. The Company’s 2019 annual stockholders’ meeting will be held in Nashville, Tennessee on April 26, 2019 at 2:00 p.m. local time for stockholders of record as of March 7, 2019. HCA will host a conference call for investors at 9:00 a.m. Central Standard Time today. All interested investors are invited to access a live audio broadcast of the call via webcast. The broadcast also will be available on a replay basis beginning this afternoon. The webcast can be accessed at: https://event.webcasts.com/starthere.jsp?ei=1227067&tp_key=d9ae4cc595 or through the Company’s Investor Relations web page at www.hcahealthcare.com. This press release contains forward-looking statements within the meaning of the federal securities laws, which involve risks and uncertainties. Forward-looking statements include the Company’s financial guidance for the year ending December 31, 2019, as well as other statements that do not relate solely to historical or current facts. Forward-looking statements can be identified by the use of words like “may,” “believe,” “will,” “expect,” “project,” “estimate,” “anticipate,” “plan,” “initiative” or “continue.” These forward-looking statements are based on our current plans and expectations and are subject to a number of known and unknown uncertainties and risks, many of which are beyond our control, which could significantly affect current plans and expectations and our future financial position and results of operations. These factors include, but are not limited to, (1) the impact of our substantial indebtedness and the ability to refinance such indebtedness on acceptable terms, (2) the impact of the Patient Protection and Affordable Care Act, as amended by the Health Care and Education Reconciliation Act of 2010 (collectively, the “Health Reform Law”), including the effects of court challenges to, any repeal of, or changes to, the Health Reform Law or changes to its implementation, the possible enactment of additional federal or state health care reforms and possible changes to other federal, state or local laws or regulations affecting the health care industry, (3) the effects related to the continued implementation of the sequestration spending reductions required under the Budget Control Act of 2011, and related legislation extending these reductions, and the potential for future deficit reduction legislation that may alter these spending reductions, which include cuts to Medicare payments, or create additional spending reductions, (4) increases in the amount and risk of collectability of uninsured accounts and deductibles and copayment amounts for insured accounts, (5) the ability to achieve operating and financial targets, and attain expected levels of patient volumes and control the costs of providing services, (6) possible changes in Medicare, Medicaid and other state programs, including Medicaid supplemental payment programs or Medicaid waiver programs, that may impact reimbursements to health care providers and insurers and the size of the uninsured or underinsured population, (7) the highly competitive nature of the health care business, (8) changes in service mix, revenue mix and surgical volumes, including potential declines in the population covered under third-party payer agreements, the ability to enter into and renew third-party payer provider agreements on acceptable terms and the impact of consumer-driven health plans and physician utilization trends and practices, (9) the efforts of health insurers, health care providers, large employer groups and others to contain health care costs, (10) the outcome of our continuing efforts to monitor, maintain and comply with appropriate laws, regulations, policies and procedures, (11) increases in wages and the ability to attract and retain qualified management and personnel, including affiliated physicians, nurses and medical and technical support personnel, (12) the availability and terms of capital to fund the expansion of our business and improvements to our existing facilities, (13) changes in accounting practices, (14) changes in general economic conditions nationally and regionally in our markets, (15) the emergence and effects related to infectious diseases, (16) future divestitures which may result in charges and possible impairments of long-lived assets, (17) changes in business strategy or development plans, (18) delays in receiving payments for services provided, (19) the outcome of pending and any future tax audits, disputes and litigation associated with our tax positions, (20) potential adverse impact of known and unknown government investigations, litigation and other claims that may be made against us, (21) the impact of potential cybersecurity incidents or security breaches, (22) our ongoing ability to demonstrate meaningful use of certified electronic health record technology, (23) the impact of natural disasters, such as hurricanes and floods, or similar events beyond our control, (24) the effects of the 2017 Tax Cuts and Jobs Act, including potential legislation or interpretive guidance that may be issued by federal and state taxing authorities or other standard-setting bodies, and (25) other risk factors described in our annual report on Form 10-K for the year ended December 31, 2017, our current report on Form 8-K filed January 17, 2019 and our other filings with the Securities and Exchange Commission. Many of the factors that will determine our future results are beyond our ability to control or predict. In light of the significant uncertainties inherent in the forward-looking statements contained herein, readers should not place undue reliance on forward-looking statements, which reflect management’s views only as of the date hereof. We undertake no obligation to revise or update any forward-looking statements, or to make any other forward-looking statements, whether as a result of new information, future events or otherwise. All references to “Company” and “HCA” as used throughout this release refer to HCA Healthcare, Inc. and its affiliates. * Reclassifications between inpatient surgery cases and outpatient surgery cases for 2017 have been made to conform to the 2018 presentation. (a) Net income attributable to HCA Healthcare, Inc., excluding losses (gains) on sales of facilities and losses on retirement of debt, and Adjusted EBITDA should not be considered as measures of financial performance under generally accepted accounting principles ("GAAP"). We believe net income attributable to HCA Healthcare, Inc., excluding losses (gains) on sales of facilities and losses on retirement of debt, and Adjusted EBITDA are important measures that supplement discussions and analysis of our results of operations. We believe it is useful to investors to provide disclosures of our results of operations on the same basis used by management. Management relies upon net income attributable to HCA Healthcare, Inc., excluding losses (gains) on sales of facilities and losses on retirement of debt, and Adjusted EBITDA as the primary measures to review and assess operating performance of its health care facilities and their management teams. The Company's forecasted guidance range is based on current plans and expectations and is subject to a number of known and unknown uncertainties and risks. (a) The Company does not forecast the impact of items such as, but not limited to, losses (gains) on sales of facilities, losses on retirement of debt, legal claim costs (benefits) and impairments of long-lived assets because the Company does not believe that it can forecast these items with sufficient accuracy. (b) Adjusted EBITDA should not be considered a measure of financial performance under generally accepted accounting principles ("GAAP"). We believe Adjusted EBITDA is an important measure that supplements discussions and analysis of our results of operations. We believe it is useful to investors to provide disclosures of our results of operations on the same basis used by management. Management relies upon Adjusted EBITDA as a primary measure to review and assess operating performance of its health care facilities and their management teams.